For Bengalis in India and Bengal, hilsa fish is considered to be a favorite food. For this reason, its cooked in a variety of ways with a wide variety of ingredients. 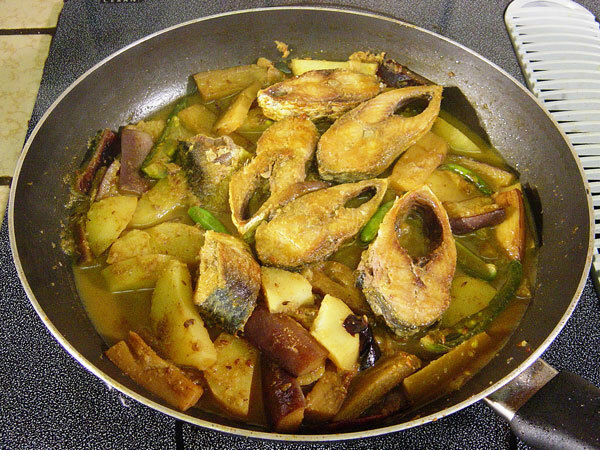 In this video we show you how to cook hilsa fish curry with potato and eggplant. First cleaning and frying the marinated hilsa fish in oil. Then frying the potato and eggplant with the spices. And finally cooking the spiced vegetables with the fish to completion. To marinate sprinkle the salt over the fish slices. Then sprinkle the turmeric powder. Spread the spices evenly over the fish by hand. In a moderately hot pan, pour in the mustard oil. When the oil is hot, put the fish in. As it starts sizzling, you may want to cover the pan so that it does not splatter. After a few minutes, remove the cover and turn the fish pieces over. Continue this process several times till the fish pieces are golden brown on all sides. Then remove the fried fish from the oil onto a plate. In the same pan with hot oil, add the dry red chilies. 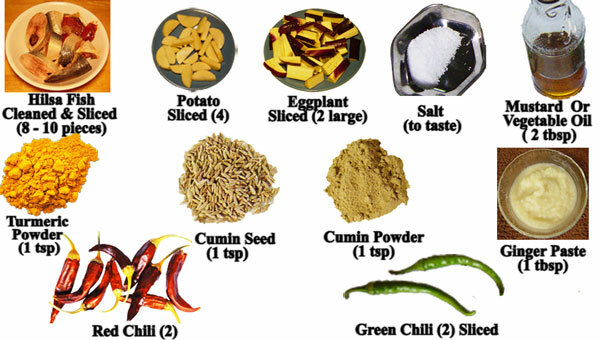 Add the green chili slices. Stir the mixture for another 2-3 minutes. Occasionally open the cover to stir. Check if the potato is soft. If the curry is too dry add some water. Then add the fish pieces. Check the salt and add some more if it is necessary. When the gravy reaches right consistency, turn off the heat and remove the pan. This completes the hilsa fish curry with potato and eggplant.. It takes around 35 to 40 minutes to cook and is sufficient for 3-4 people. Serve the hilsa fish curry hot with steamed white rice.